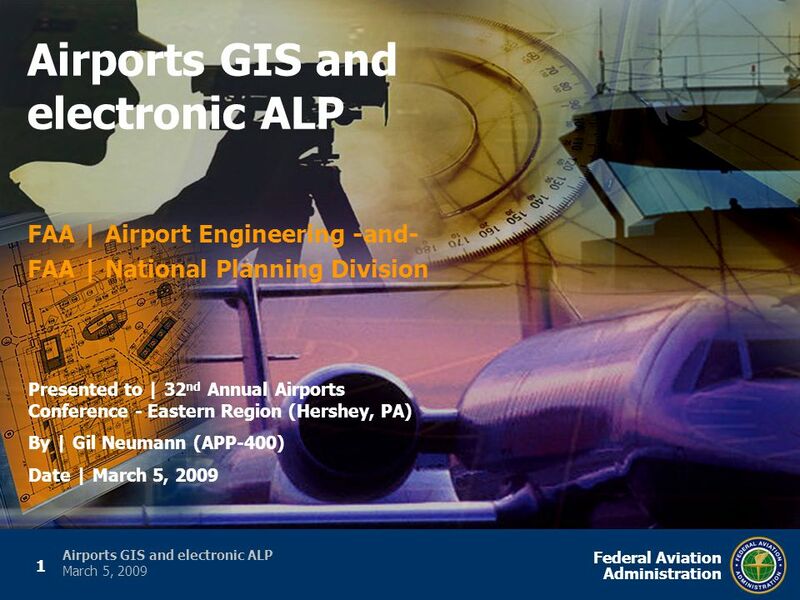 1 Federal Aviation Administration Airports GIS and electronic ALP March 5, 2009 FAA | Airport Engineering -and- FAA | National Planning Division Airports. 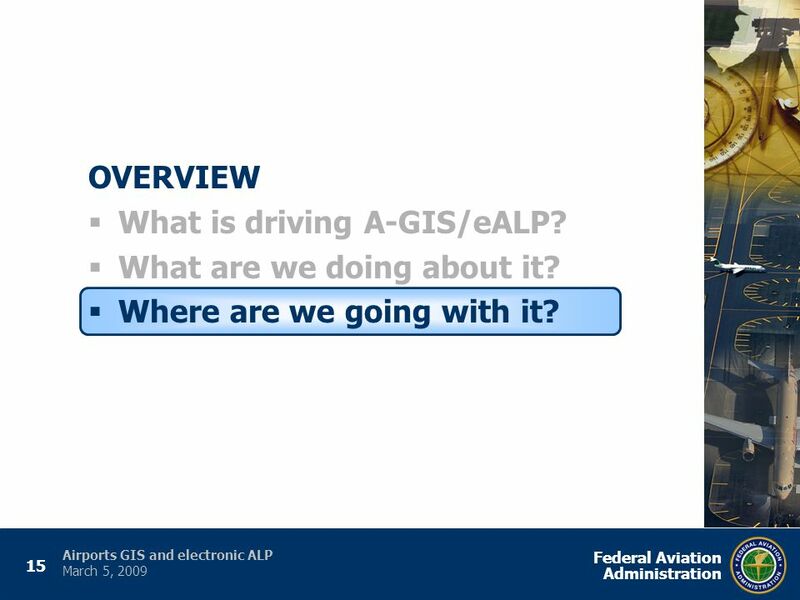 2 2 Federal Aviation Administration Airports GIS and electronic ALP March 5, 2009 OVERVIEW  What is driving A-GIS/eALP?  What is our approach/process? 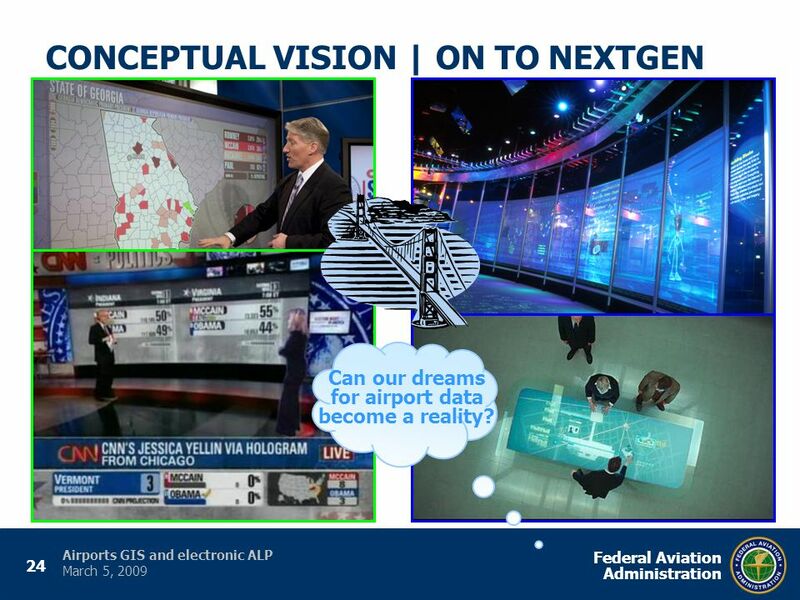  Where are we going with it? 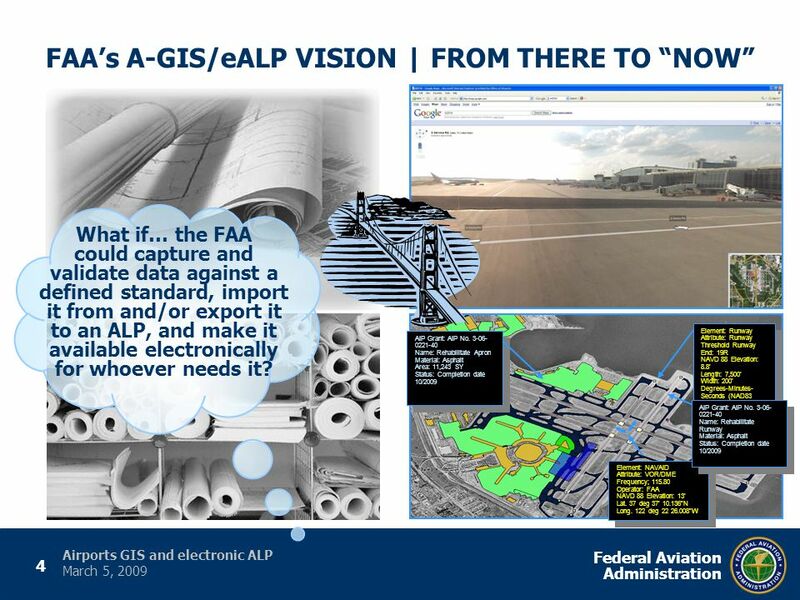 4 4 Federal Aviation Administration Airports GIS and electronic ALP March 5, 2009 FAA’s A-GIS/eALP VISION | FROM THERE TO “NOW” Element: Runway Attribute: Runway Threshold Runway End: 19R NAVD 88 Elevation: 8.8’ Length: 7,500’ Width: 200’ Degrees-Minutes- Seconds (NAD83 DMS) Lat. 37 deg 37' 37.94" N Long. 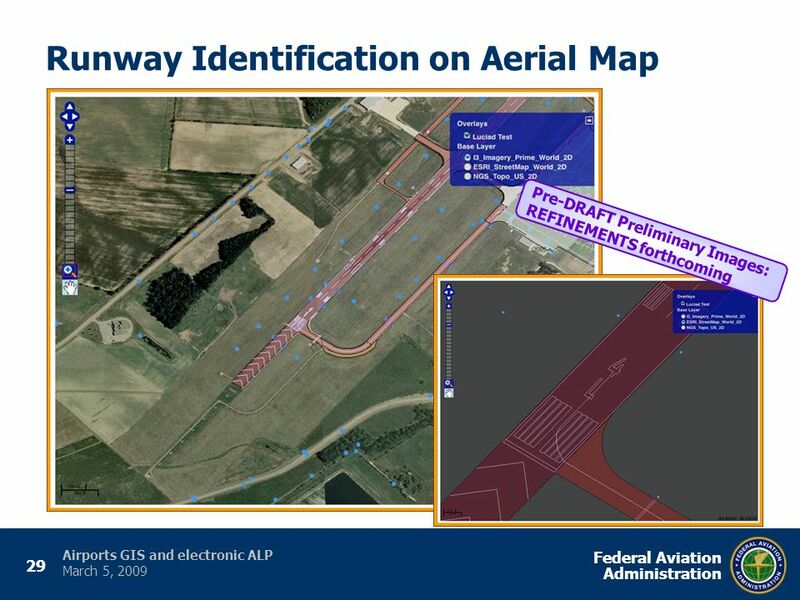 122 deg 22' 12.44" W Element: Runway Attribute: Runway Threshold Runway End: 19R NAVD 88 Elevation: 8.8’ Length: 7,500’ Width: 200’ Degrees-Minutes- Seconds (NAD83 DMS) Lat. 37 deg 37' 37.94" N Long. 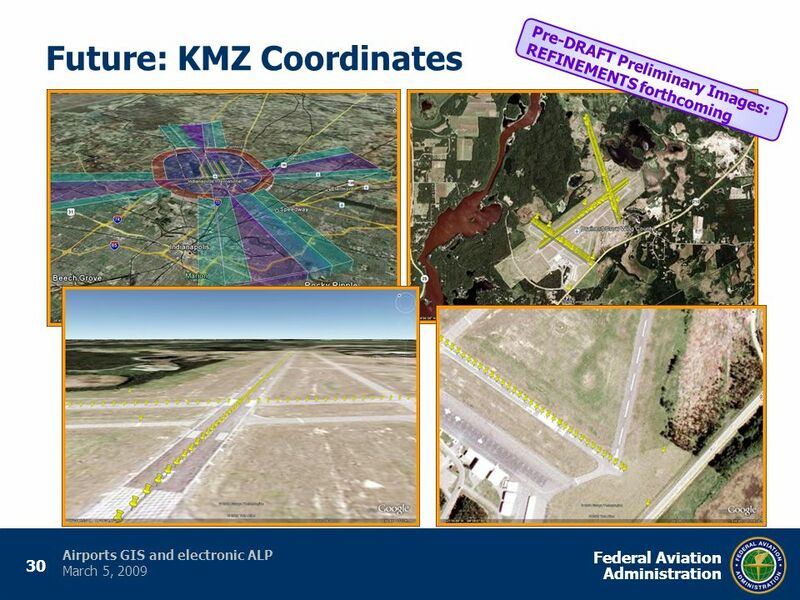 122 deg 22' 12.44" W Element: NAVAID Attribute: VOR/DME Frequency; 115.80 Operator: FAA NAVD 88 Elevation: 13’ Lat. 37 deg 37’ 10.136”N Long. 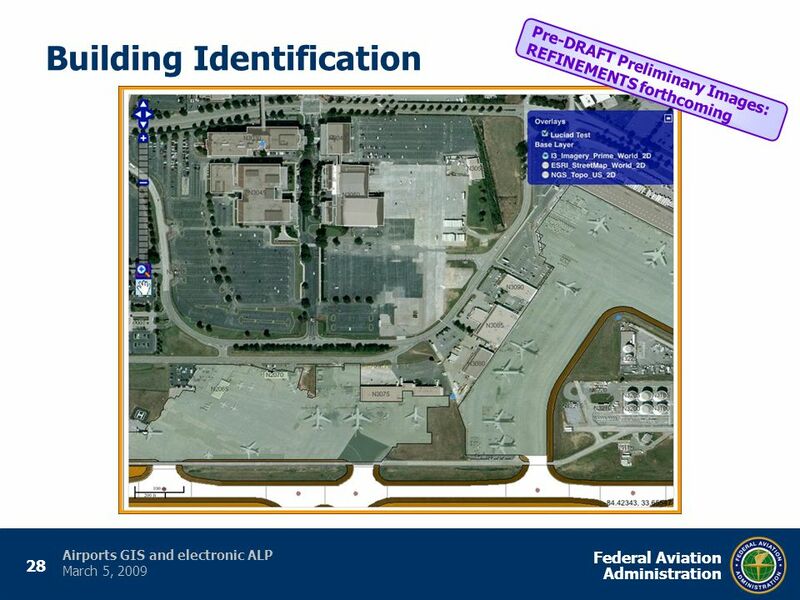 122 deg 22 26.008”W Element: NAVAID Attribute: VOR/DME Frequency; 115.80 Operator: FAA NAVD 88 Elevation: 13’ Lat. 37 deg 37’ 10.136”N Long. 122 deg 22 26.008”W AIP Grant: AIP No. 3-06- 0221-40 Name: Rehabilitate Apron Material: Asphalt Area: 11,243 SY Status: Completion date 10/2009 AIP Grant: AIP No. 3-06- 0221-40 Name: Rehabilitate Apron Material: Asphalt Area: 11,243 SY Status: Completion date 10/2009 AIP Grant: AIP No. 3-06- 0221-40 Name: Rehabilitate Runway Material: Asphalt Status: Completion date 10/2009 AIP Grant: AIP No. 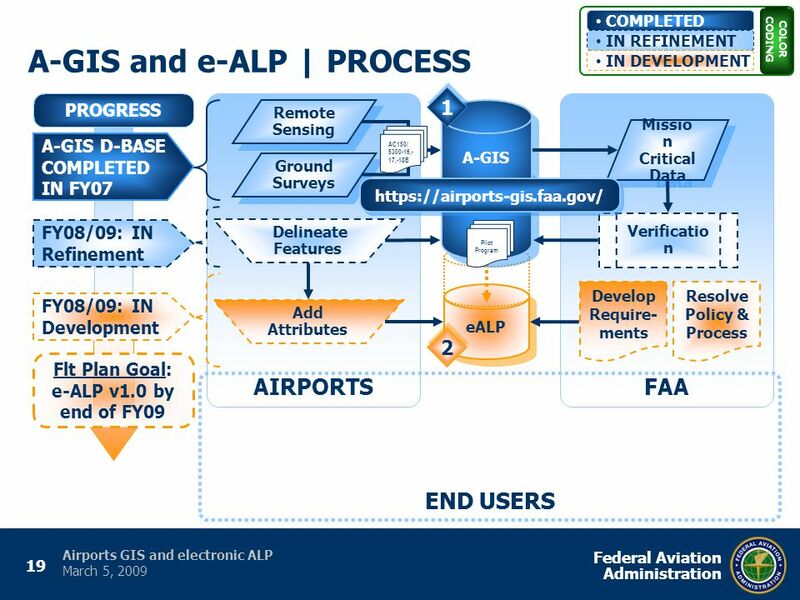 3-06- 0221-40 Name: Rehabilitate Runway Material: Asphalt Status: Completion date 10/2009 What if… the FAA could capture and validate data against a defined standard, import it from and/or export it to an ALP, and make it available electronically for whoever needs it? 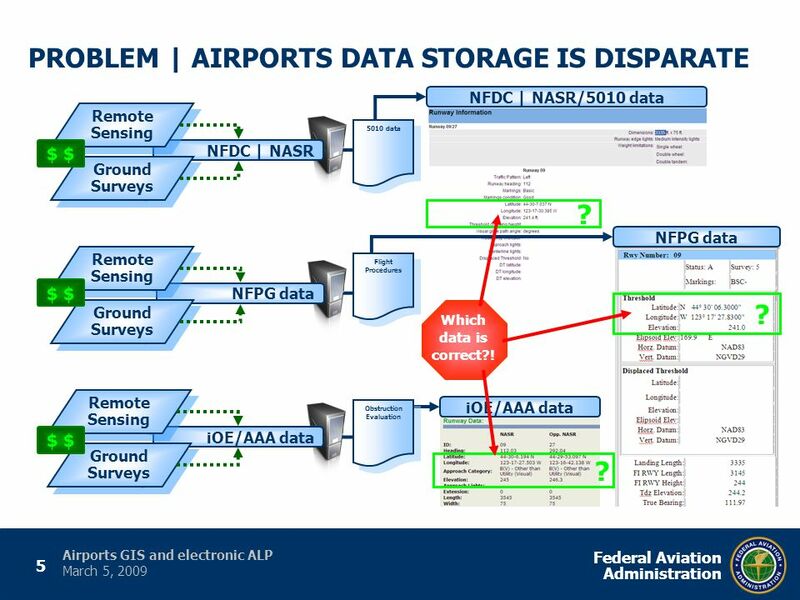 5 5 Federal Aviation Administration Airports GIS and electronic ALP March 5, 2009 iOE/AAA data Obstruction Evaluation NFDC | NASR/5010 data 5010 data NFPG data Flight Procedures NFDC | NASR iOE/AAA data NFPG data PROBLEM | AIRPORTS DATA STORAGE IS DISPARATE Remote Sensing Ground Surveys Remote Sensing Ground Surveys Remote Sensing Ground Surveys $ ? ? ? Which data is correct?! 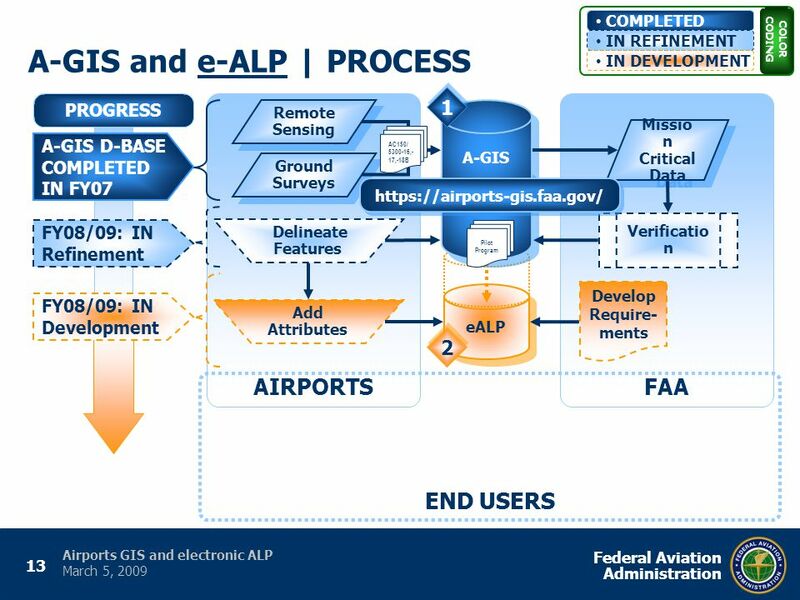 9 9 Federal Aviation Administration Airports GIS and electronic ALP March 5, 2009 OVERVIEW  What is driving A-GIS/eALP?  What is our approach/process?  Where are we going with it? 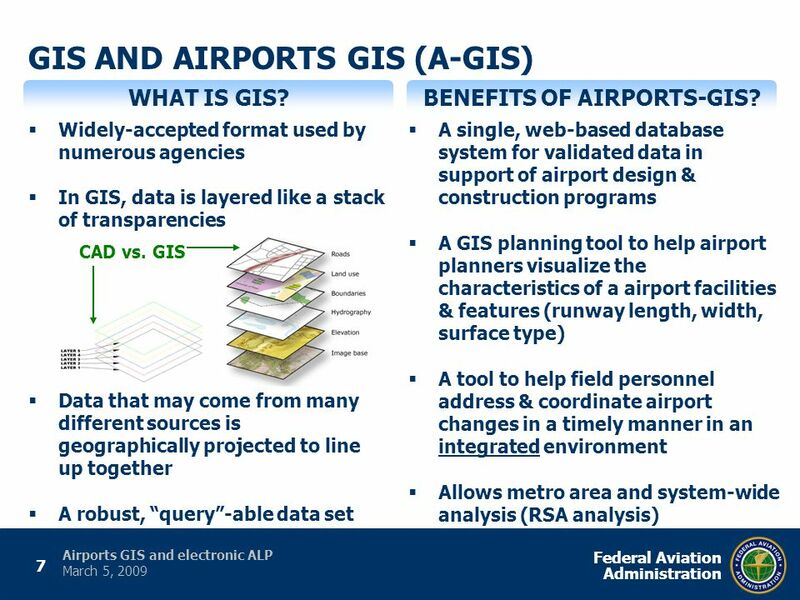 12 12 Federal Aviation Administration Airports GIS and electronic ALP March 5, 2009 A-GIS Remote Sensing Ground Surveys Verificatio n Missio n Critica l Data https://airports-gis.faa.gov/ HOW A-GIS AFFECTS THE FIELD  Sponsors: A-GIS is now the single web-based information depository for airports data  https://airports-gis.faa.gov/ (managed by ARP; owned by ATO)  Planners: A-GIS affects the way FAA does business on all projects with survey requirements; get familiarized with website and ACs  Survey work at airports must comply with the requirements found in AC150/5300-16A, -17B, and -18B  Work with ADOs for: guidance on how to use ACs (content questions); A-GIS website registration/use; SOWs for projects (reference -18B|Table 2-1); refinement suggestions  Survey quality control plans and final survey reports must be submitted (for NGS review) via FAA’s A-GIS website What should airport sponsors and surveyors be doing now with A-GIS?  EDUCATE ! 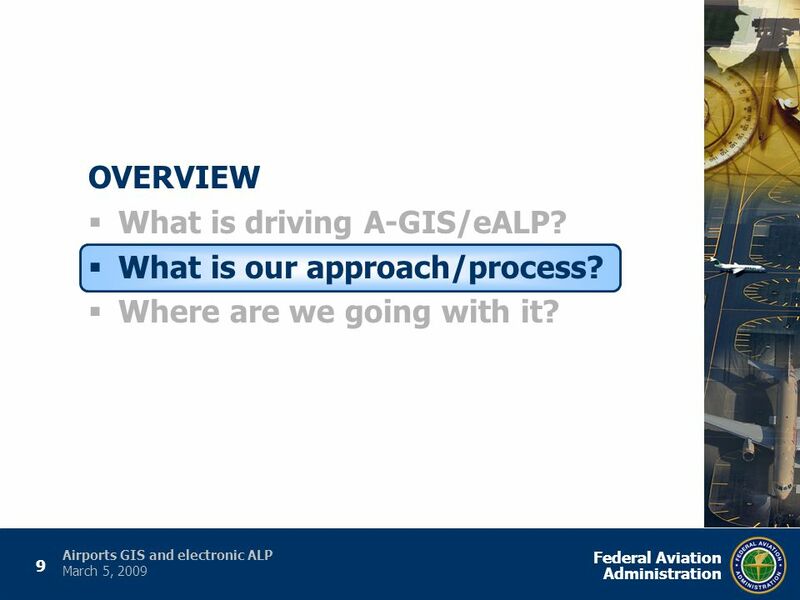 15 15 Federal Aviation Administration Airports GIS and electronic ALP March 5, 2009 OVERVIEW  What is driving A-GIS/eALP?  What are we doing about it?  Where are we going with it? 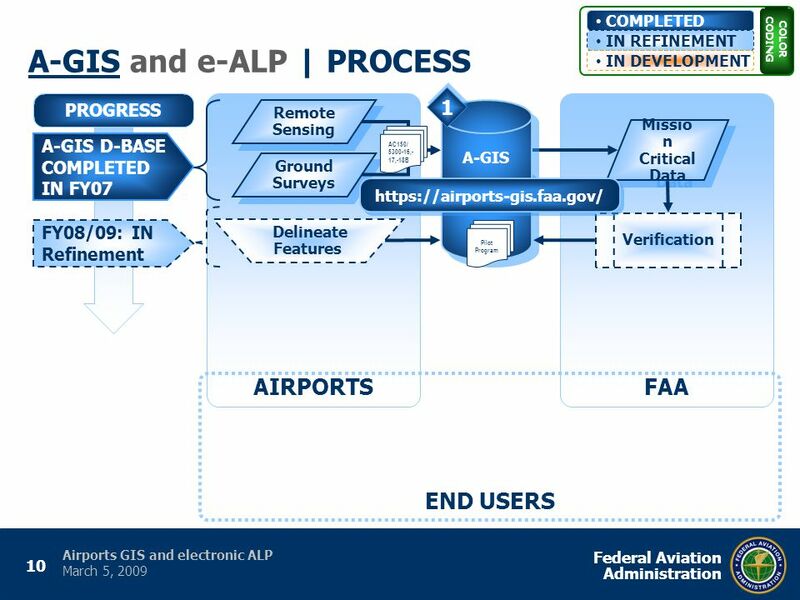 20 20 Federal Aviation Administration Airports GIS and electronic ALP March 5, 2009 eALP Add Attributes Develop Require- ments Resolve Policy & Process eALP | NEXT STEPS  Education available? 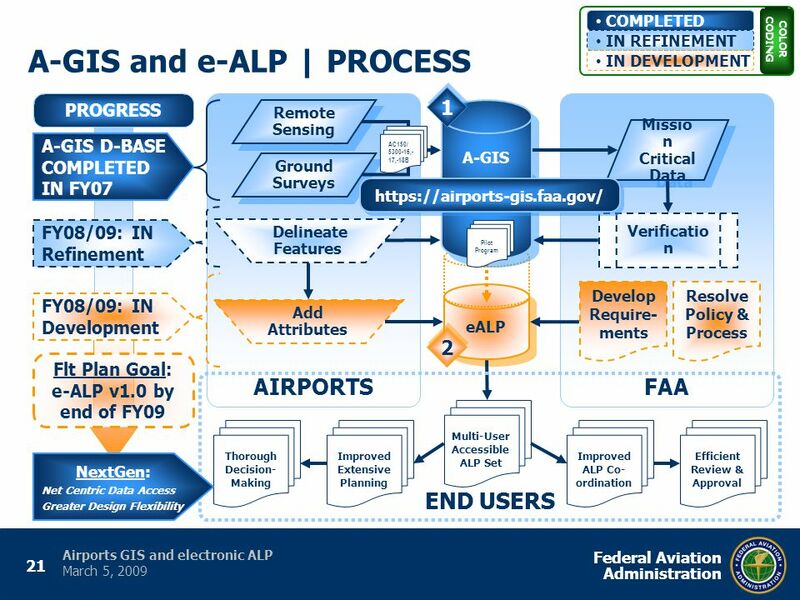  Implementation plan?  Financial eligibility? 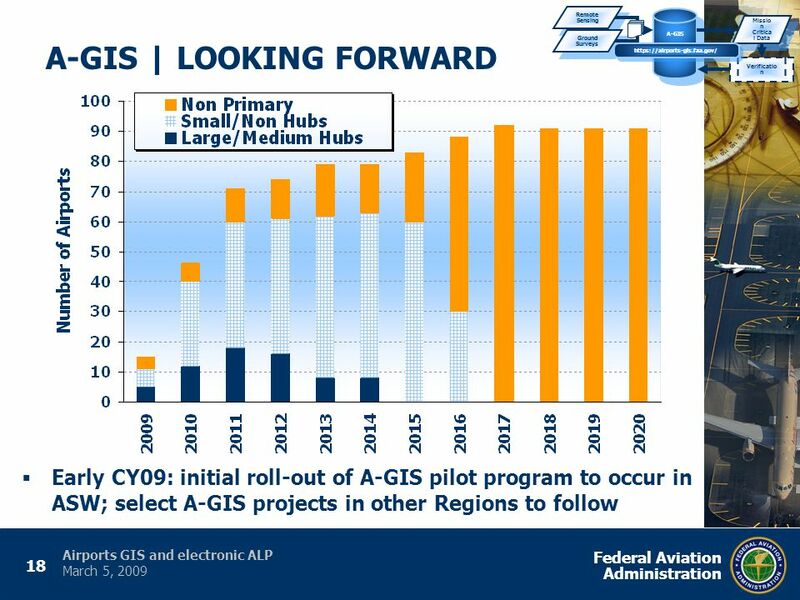  Policy implications? More work? Less work? ---- ADO Bus. 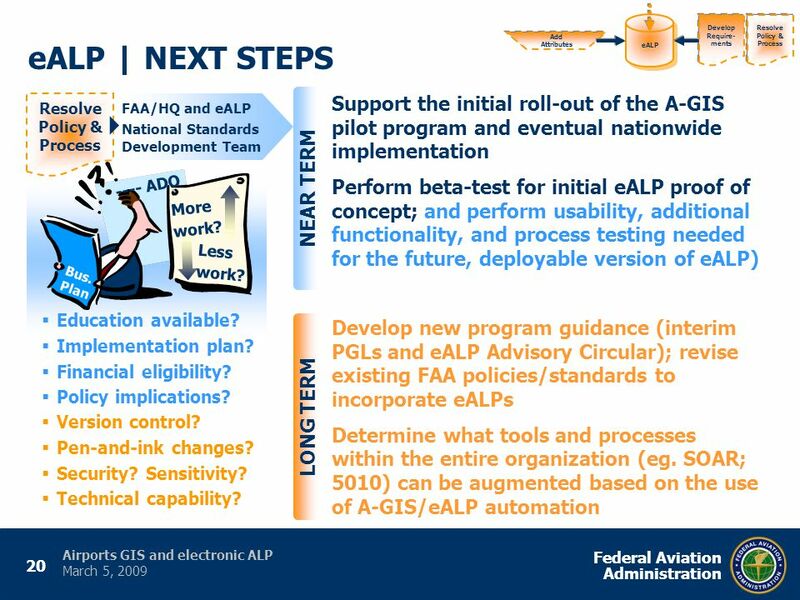 Plan  Support the initial roll-out of the A-GIS pilot program and eventual nationwide implementation  Perform beta-test for initial eALP proof of concept; and perform usability, additional functionality, and process testing needed for the future, deployable version of eALP) NEAR TERM FAA/HQ and eALP National Standards Development Team Resolve Policy & Process  Develop new program guidance (interim PGLs and eALP Advisory Circular); revise existing FAA policies/standards to incorporate eALPs  Determine what tools and processes within the entire organization (eg. 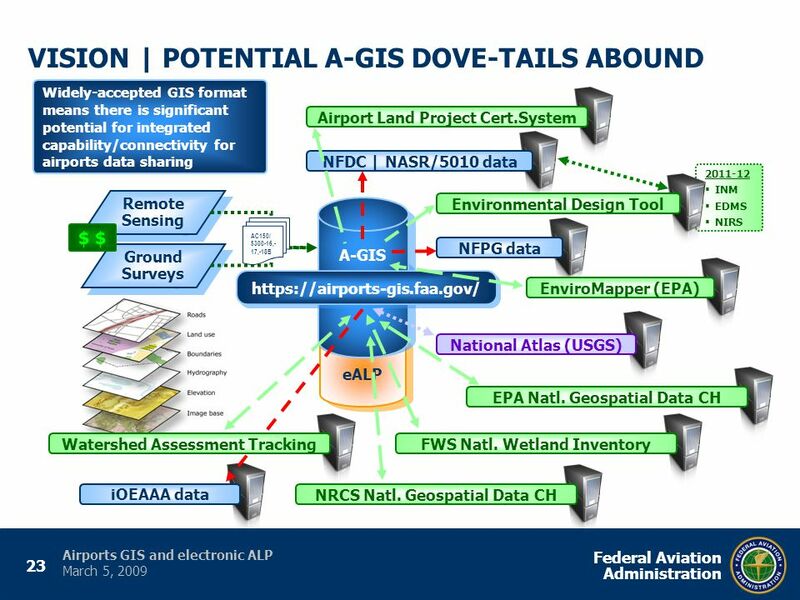 SOAR; 5010) can be augmented based on the use of A-GIS/eALP automation LONG TERM  Version control?  Pen-and-ink changes?  Security? Sensitivity?  Technical capability? 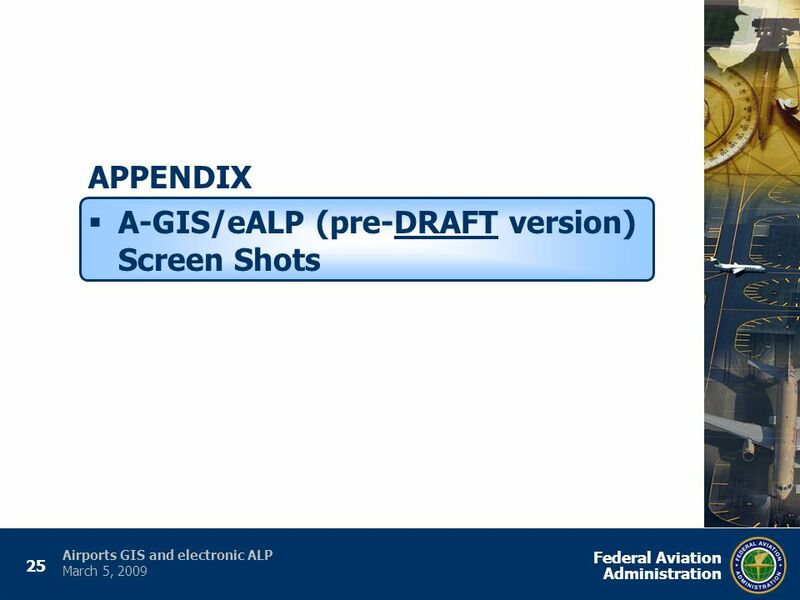 22 22 Federal Aviation Administration Airports GIS and electronic ALP March 5, 2009  Anticipate A-GIS and eALP guidance relative to program adjustments and associated policy changes for conducting surveys and electronically-generated ALP drawing sets as the program database and software is refined  Help the Airport Planning and Design Community: ‣ Get up to speed with A-GIS Advisory Circulars and the A- GIS website ‣ Submit reasonable survey costs in SOWs ‣ Suggest practical improvements and best practices based on realistic challenges you face at your airport and in the field A-GIS/eALP | LOOKING FORWARD There is currently a challenging transition period; thus be prepared to make progress w/end-state in mind. 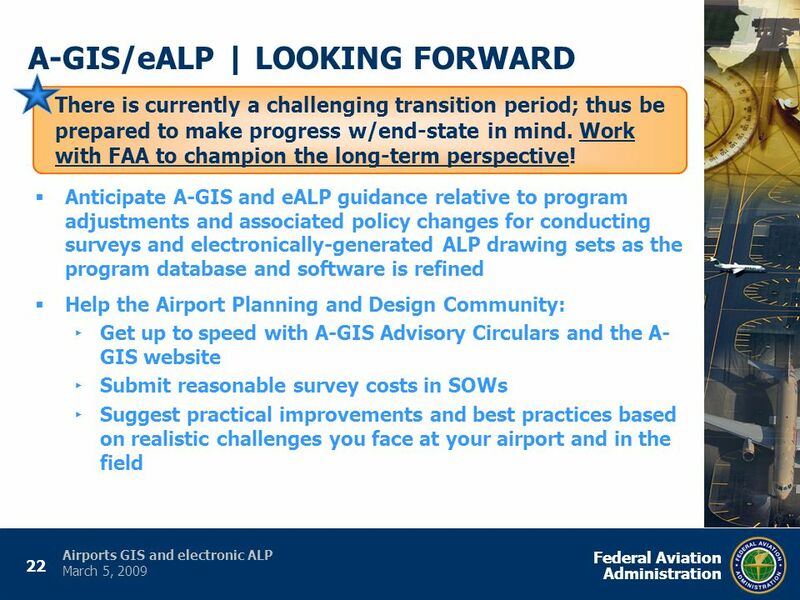 Work with FAA to champion the long-term perspective! 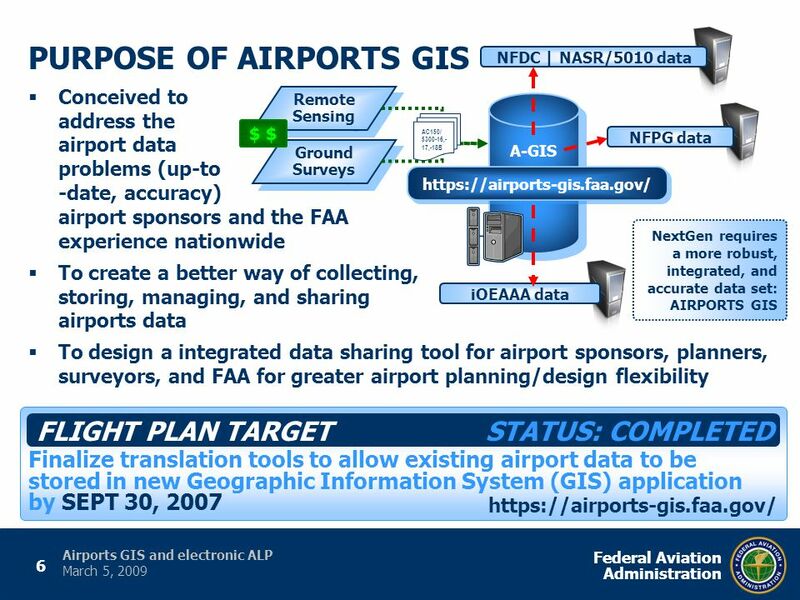 24 24 Federal Aviation Administration Airports GIS and electronic ALP March 5, 2009 CONCEPTUAL VISION | ON TO NEXTGEN Can our dreams for airport data become a reality? 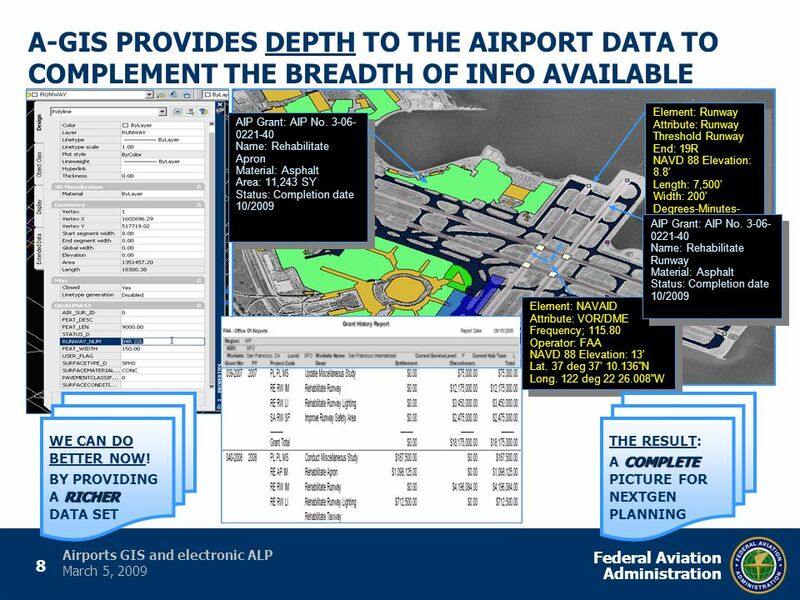 Download ppt "1 Federal Aviation Administration Airports GIS and electronic ALP March 5, 2009 FAA | Airport Engineering -and- FAA | National Planning Division Airports." Introduction ATMCP and Performance Dominique Colin de Verdière (CENA) Bernard Miaillier (Eurocontrol) TIM9 - ATMCP-RTSP May 2002. 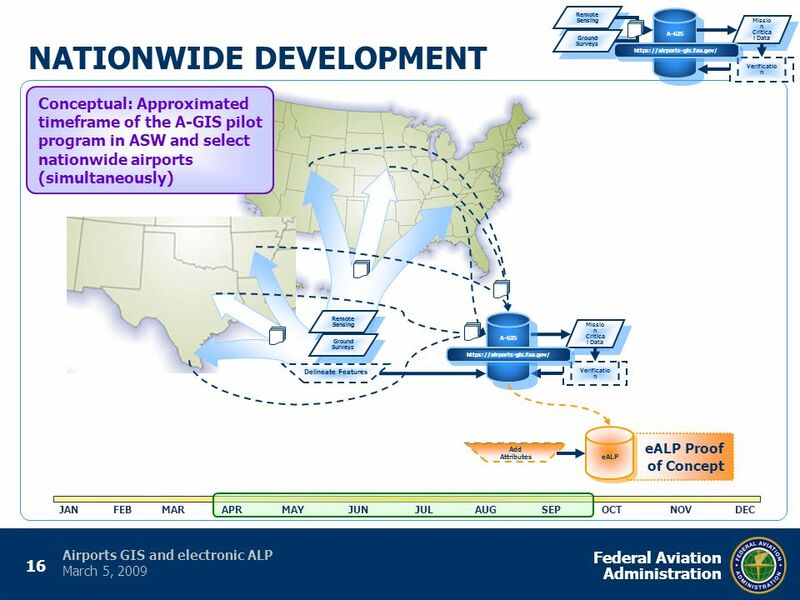 Federal Aviation Administration International Flight Inspection Symposium June 24, 2008 James H. Washington Vice President, Acquisition and Business Services. 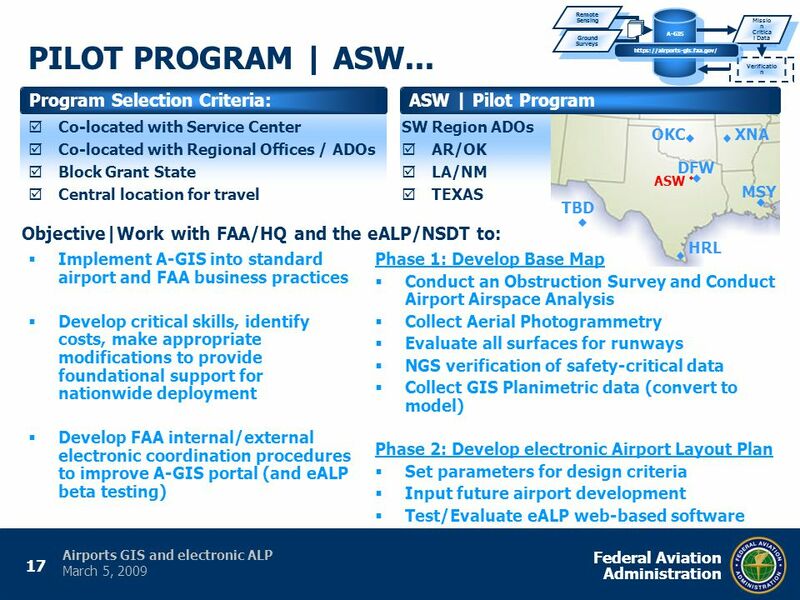 Agenda Introduction Advisory Circular Changes Consultant Selection Procedures Contract Format and Provisions Methods of Contracting and Allowable Costs. Presenter Todd G. Johnson, Airport Solutions Specialist September 14, 2012. SLO – GIS User’s Group Airports GIS (AGIS) September 8, 2011 Matt Cunningham, PLS Aviation Division Manager. 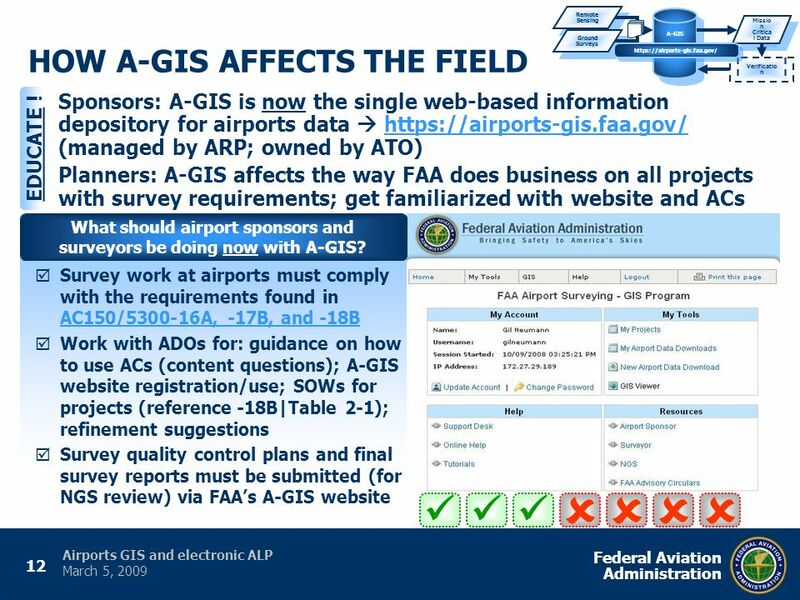 Federal Aviation Administration FAA Airports Programs Update IRWA Federal Agency Update Washington, DC March 24, 2014 Rick Etter FAA Office of Airports. 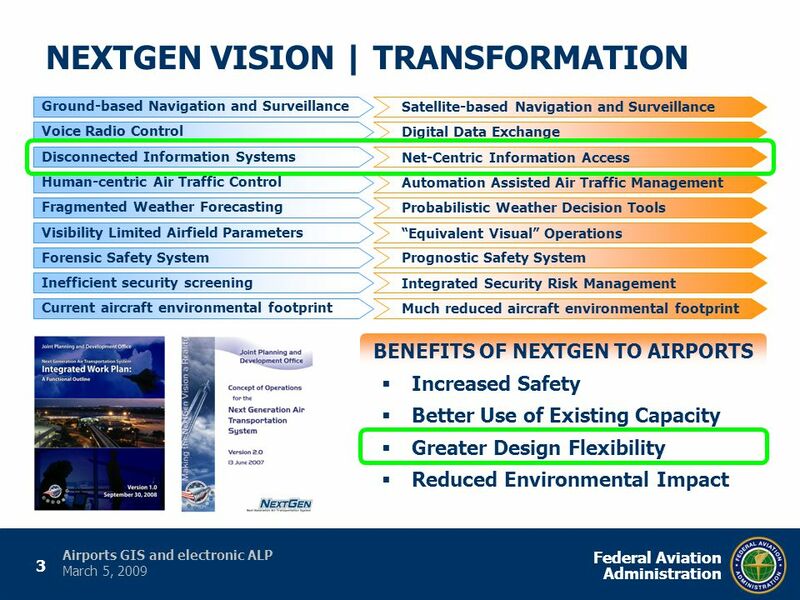 BY S V SATISH GM (AIR TRAFFIC MANAGEMENT) AIRPORTS AUTHORITY OF INDIA. 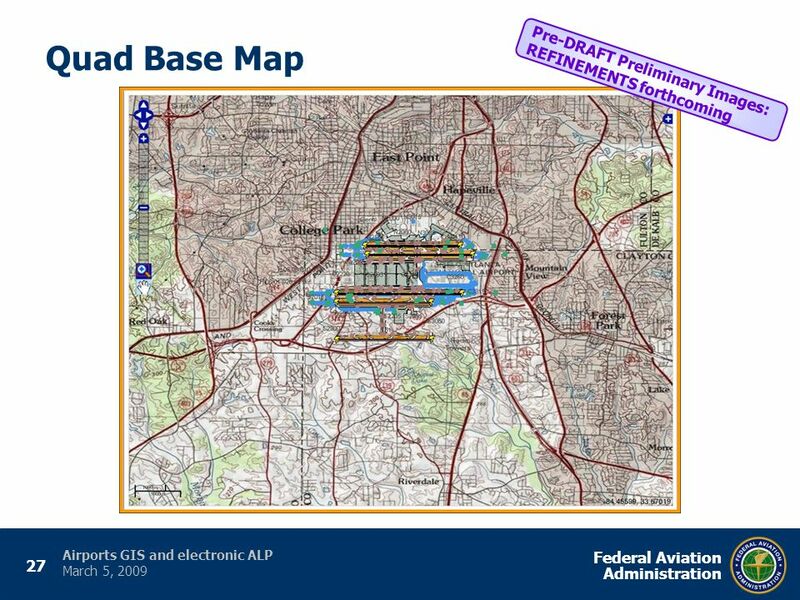 Ken Jacobs Airport Planning & Environmental Division March 3, 2010 Federal Aviation Administration Federal Aviation Administration 33. 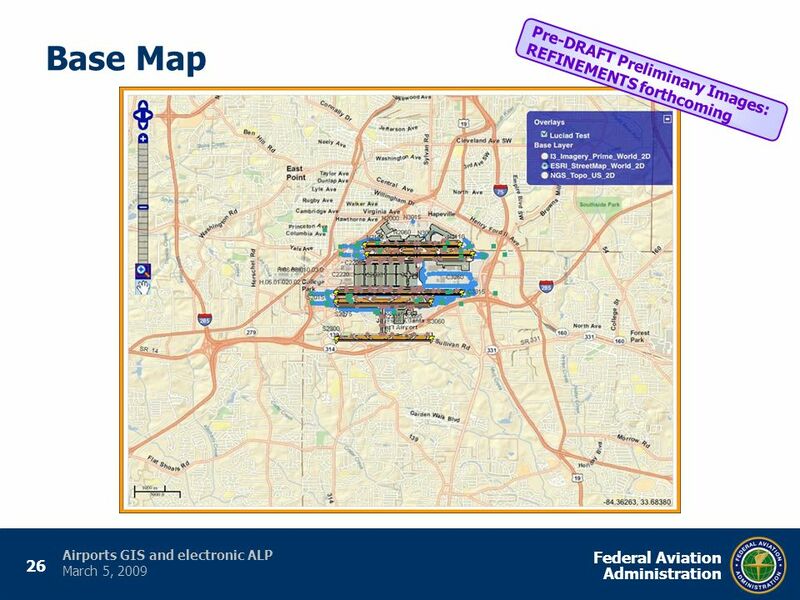 Presented to: By: Date: Federal Aviation Administration Properly Aligning your ACIP for the annual planning meeting 2014 Annual ACA Conference Patrick. 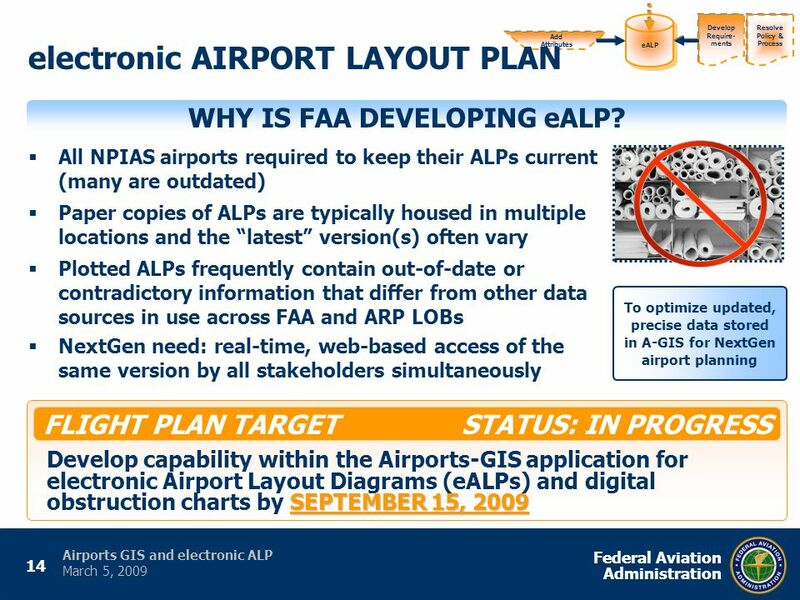 Electronic Airport Layout Plans - “eALP” ACA, September 15, 2010 Kevin Shirer, AAE. 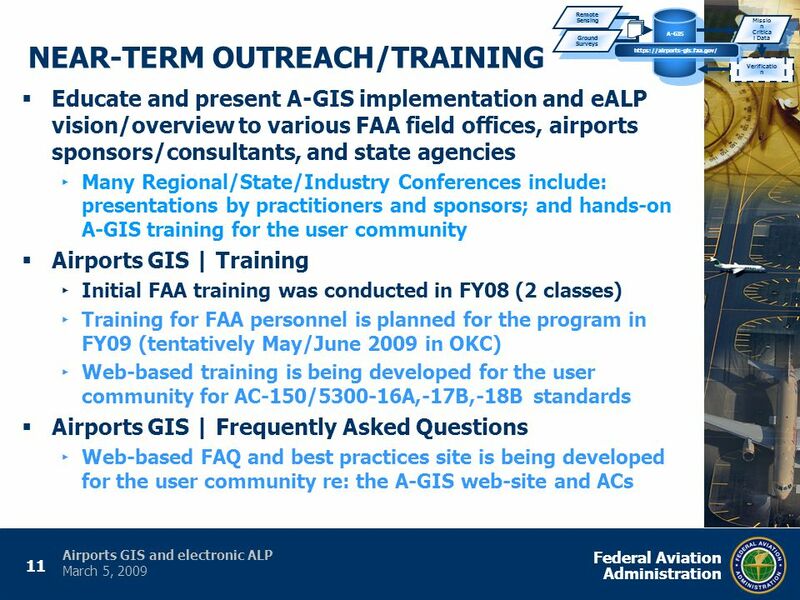 1 1 Aeronautical Information Services Brief to AIXM User Group 27 February 2007.